Applications: for assemble and decorative topstitching luxurious leather sofas, fabric sofas, armchair, couch lounge, chair, car seat covers, furniture, shoes, saddles, leather crafts, automotive upholstery, marine upholstery, aerospace upholstery, leather bags and other high-end leather goods. Features: The Durkopp Adler 204 type extra large barrel shuttle is specially designed for processing the extreme thick thread (1.4mm braided thread) and heavy weight materials; Triple feed mechanism ensures constantly tight stitch formation, even with large stitch length; High needle penetration power and excellent climbing capacity guarantee easy sewing thick spots or cross seams (over transversal seams), without skipped stitch, loose bottom thread, shorten stitch length, bobbin thread Knots and Tangles; The sewing foot stroke up to 10 mm allows the safe climbing over differently high material plies; Pneumatic additional thread tension for excellent stitch formation when sewing over thick spots or overlapping seams; Up to 13 mm long stitches for decorative topstitching seams; Thread puller is available for even thread tension. Looking for ideal Post Bed Heavy Duty Upholstery Sewing Machine Manufacturer & supplier ? We have a wide selection at great prices to help you get creative. 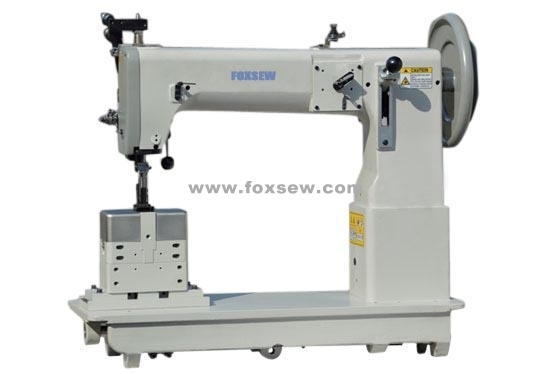 All the Post Bed Triple Feed Upholstery Sewing Machine are quality guaranteed. We are China Origin Factory of Post Bed Compound Feed Heavy duty sewing machine. If you have any question, please feel free to contact us.